Sorry for being late this morning I'd obviously forgotten to click the publish button!! Old age!! This is possibly my biggest smile of the week for me. Since we moved, nearly 4 years ago we have had no more than 1.9Mbps of Internet even though we are now living on the outskirts of the town.....even out in the little village where we moved from we had 19Mbps at least!! We have kept asking when our BT box would be updated and eventually this Wednesday we have cable connection. There had been a problem with updating the box we are attached to as it's on someone's property apparently. As you can see we now have 36.8Mbps and whooooo it's made a huge difference. 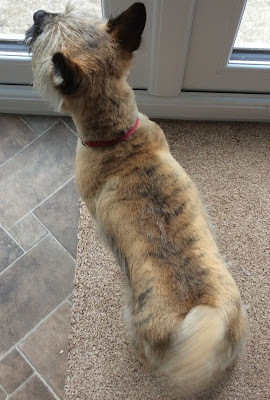 Milly had her hair cut last week and you can now see her stripes again....she's like a little tiger now and she's so much happier in the sunny weather we've been having. 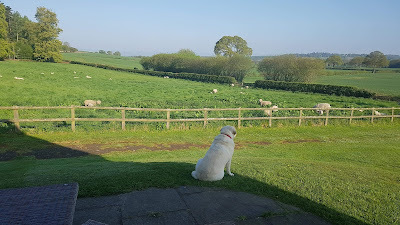 The local farmer who put sheep in Amy's field has now moved them round to their other field and as you can see Poppy is enjoying watching them munch the new long grass.....they have been escaping in several places so Amy has been playing shepherd and rounding them up a few times.....I'm sorry to say Poppy isn't much of a sheep dog! Finally I'm sharing the riot of colour that are all around our garden now. 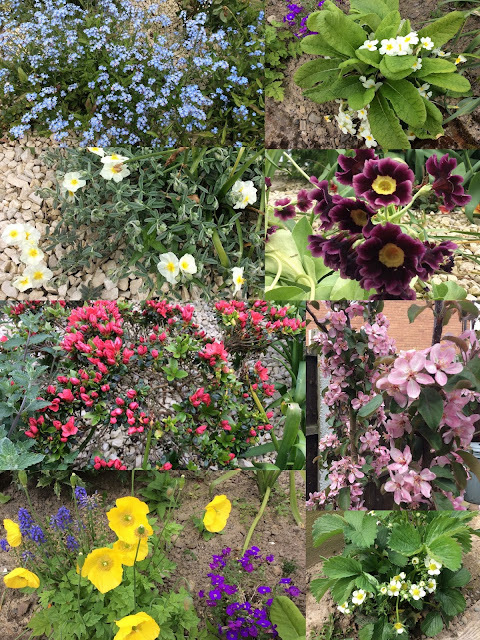 I try to snap them when they are in bloom because so many of them this year seem to be dropping their blooms quickly and aren't lasting long. Aren't they beautiful? Now please leave me a little comment and then share your own smiles by linking them up below and thanks for calling in and joining in the fun. Oh waht a blessing to have such fast internet.Congratulations on this huge smile! In the UK wehad cable and it was very fast. Now we are out in the sticks and we depend on radio signals. I never get to 10 Mb. So frustrating. We can't watch any movies or videos. Aaargh! Milly looks very smart indeed and the children have had lots of fun over the Bank holiday weekend, I can see that. Your flowers are so pretty. Have you still got that helleboris flowering? Or is that one you 'made earlier'? Now I have linked up (or so I think) but my name is not in the list. When I try to do it again, it tells me my name is on the list. (but I can't see it...) Anyway, I tried. I'm glad this week has been better for you 💖 Fast broadband is an essential these days, what a difference it makes! Milly's stripes are rather gorgeous, I spent money last Wed at the hairdressers trying to achieve the same effect, lol! Wall to wall smiles today, Annie. Thank you for sharing.